Endosulfan is synthetic chlorinated cyclodiene that is a persistent organic pollutant acting like endocrine disruptor. It is primarily used to protect crops such as tea, fruits, vegetables, grains and wood, from a wide variety of insects and mites through contact poison. Present study illustrates carcinogenic activity of endosulfan. The ‘treatment’ group received Endosulfan @ 3 mg/kg b.w./day by gavage method for five weeks. Then this group was left for six months without any treatment. About 10% mice showed ovarian tumor. Microphotograph of ovary of endosulfan pretreated mice shown degenerated cytoplasm with uneven distribution of nucleus in the medullary region of ovary. Abundant polyribosomes and degenerated mitochondria were observed. 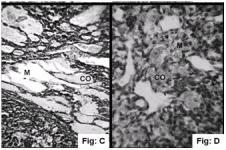 De-shaped multilobed nuclei with loss of nucleopore complex were also observed. Lipid peroxidation (LPO) increased by 48 fold while estrogen level increased by 11 fold. These findings indicate that endosulfan exposure causes ovarian malignancy in mice.